The new iOS and Android versions of the classic Sonic the Hedgehog 2 game will include the Hidden Palace Zone. During development of Sega Genesis title Sonic the Hedgehog 2, a special bonus level named the Hidden Palace Zone was scrapped. The remastered iOS and Android versions, available today, will include the bonus level for the first time officially. 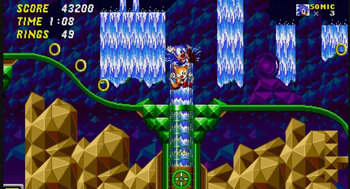 Hidden Palace Zone was originally a bonus level used after collecting the game's seven Chaos Emeralds, and Sonic would be able to transform into Super Sonic with the Chaos Emeralds. The level first appeared online in a prototype version of Sonic the Hedgehog 2, which was distributed as a ROM file. The whole level is, of course, not included because the level was never completed in development, but whatever was finished can be played through the prototype. Sonic Retro members Simon Thomley and Christian Whitehead developed the mobile version of Sonic the Hedgehog 2. Whitehead has incorporated previously cut content in his other Sonic ports, such as the Sonic the Hedgehog remake for iOS and Android, including items removed from the original. Hidden Palace was used in pieces for other games. Its name was used in an unrelated level in Sonic and Knuckles, some of the background art was used in Sonic Spinball, and a few of its elements, such as glowing bridges and spheres, were used in Sonic the Hedgehog 3. Sonic the Hedgehog 2 has already been released for iOS, so if you already own that version, you can download the new version as a free update. Android users wanting to play this remastered version will have to buy it as the game has not been released for Android before.